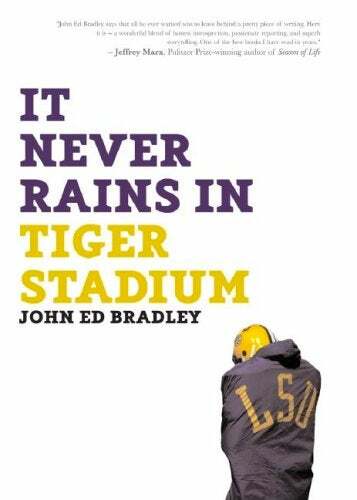 John Ed Bradley's memoir of playing football at LSU, It Never Rains in Tiger Stadium, is one of the finest sports books ever written. If you've never read it, do yourself a favor a pick up a copy. It's a beautiful book. It ends for everybody. It ends for the pro who makes $5 million a year and has his face on magazine covers and his name in the record books. It ends for the kid on the high school team who never comes off the bench except to congratulate his teammates as they file past him on their way to the Gatorade bucket. In my case it ended on Dec. 22, 1979, at the Tangerine Bowl in Orlando. We beat Wake Forest that night 34-10, in a game I barely remember but for the fact that it was my last one. When it was over, a teammate and I grabbed our heroic old coach, hoisted him on our shoulders and carried him out to the midfield crest. It was ending that day for Charles McClendon, too, after 18 years as head coach at LSU and a superb 69% career winning percentage. The next day newspapers would run photos of Coach Mac's last victory ride, with Big Eddie Stanton and me, smeared with mud, serving as his chariot. Coach had a hand raised above his head as he waved goodbye, but it would strike me that his expression showed little joy at all. He looked tired and sad. More than anything, though, he looked like he didn't want it to end. We were quiet on the flight back to Baton Rouge, and when the plane touched down at Ryan Field, no cheers went up and nobody said anything. A week or so later, done with the Christmas holidays, I went to Tiger Stadium to clean out my locker. I brought a big travel bag with me, and I stuffed it with pads, shoes, gym trunks, jockstraps, T-shirts and practice jerseys. I removed my nametag from the locker. Then I studied the purple stenciling against the gold matte. In one corner someone had scribbled the words TRAMPLE THE DEAD, HURDLE THE WEAK. The source of the legend eludes me now, but it had been a rallying cry for the team that year, especially for my mates on the offensive line. The last thing I packed was my helmet. I'd been an offensive center, and the helmet's back and sides were covered with the little Tigers decals the coaches had given out as merit badges for big plays. I ran my fingertips over the surface, feeling the scars in the hard plastic crown. There were paint smudges and streaks from helmets I'd butted over the years. Was the gold Vanderbilt or Florida State. The red Alabama or Georgia, Indiana or USC?